For 14 years, 10 months and 25 days we have been customizing pageflex to work with all of our clients needs no matter how tricky the task seemed to be. Pageflex offers a great platform to get all your web to print needs met. The way pageflex works is to provide a base storefront and options with an extension API (Application Programming Interface) to allow any type of customizations your can think of. That is where we come in. We have worked with Pageflex and designed extensions such as kits and multiple shipping which was used as a base design for what is now included inside the base storefront. We know what works and what doesn't saving you valuable time. 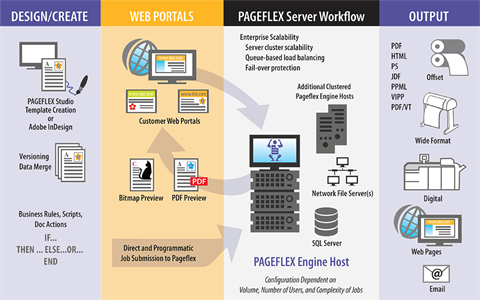 There are many parts to the Pageflex workflow below is what we can do for you. Need multiple servers (cluster based setup) or just one we have set it up before. We can get your servers setup in just a couple of hours. Need to run your servers in the cloud? No problem we currently have our dev servers setup in Azure utilizing Azure Databases and Virtual machines for the web and server components. Setting up a storefront can be intimidating. There are many options that can be added and many configurations. Let us take the worry out and provide any answers you may have about the capabilities of the Storefront Application. From 5 - 10,000 lines our extensions can meet your needs. Our extensions can be as complex as a custom kitting with linked products all setup via the admin site or as simple as hiding and removing certain items on the storefront interface. Document Actions are created to manipulate the actual rendered pages. They provide fine controls over the template that can't always be done with scripting in studio. An example is custom customs. If you would like your user to specify there own colors for headings and text the y can input the colors on the form fill and the document action will apply those colors to the template. Studio is the heart of the Pageflex suite. It allows the transformation from design files such as InDesign into a template of xml that Pageflex can understand. We can done thousands of templates over the years from simple business cards to mailers that use retirement calculations based on existing contributions to show users what there actual live accounts could look like if they added an additional 2% to their 401K. Campaign Manager allows the Storefront to send emails and have a workflow of landing pages and surveys to get your email marketing needs met. If Campaign Manager doesn't have the features you need we also do custom email campaigns through Mailchip and Mandrill. Whether you need a long term commitment or just a month or two we provide the flexability to be on call when you need us most. Most Pageflex work comes in bursts. For example Company XYZ refreshes there material every year. This mean the workload for Company XYZ is very high during 3 month out of the year but after that it slows down. Working with us allows you to only staff when needed and not having to worry about finding someone new every year for just 3 months. Call us today at 612.743.2734 and see how we can meet your Pageflex needs. The cost of this consultation is free and all you have to loose is a complex and time consuming pageflex rollout. © 2015 Designing Solutions WD. All rights reserved.